We all get sore and physically tired after a tough training session or tennis match. Don’t worry! Soreness is okay and just part of the process, but prolonged soreness can deter you from playing your best tennis. Here are some quick and easy ways to help you recover more quickly after hours on the tennis court. Rest involves two different components: sleep and time off from playing tennis. Your body does most of its rebuilding while you are in REM sleep. So in order to fully recover from a vigorous three set night match, it’s important that you get home early enough to get your sleep. Taking days off from playing tennis is also very important. If you continue to use the same muscles day after day without adequate rest, you never allow them to grow, which may lead to injury and/or poor performance. Even college and professional tennis players take a day or days off each week to rest and focus on recovery. When you are playing a lot of tennis as a junior or an adult, you need to make sure you are eating a healthy and well-rounded diet. Without adequate calorie intake your body will not be able to make the necessary repairs before your next tennis match or training session. Also remember to drink plenty of water. Water helps speed up the recovery process and forces the byproducts of exercise out of the muscles. Soft tissue techniques can be a lifesaver when you are sore. The day after your long three set match, warm-up with some easy cardio (bike, light jog, etc.) and then get to work on your recovery with foam rolling. If you are not familiar with foam rolling or self-massage techniques, you will come to love it. Foam rolling is a great way to loosen up bound fascia and help clear out those unwanted byproducts of exercise. So when you are really sore, take that extra day to work on yourself and recover. Static stretching can help you lengthen out those tight muscles and increase your flexibility. 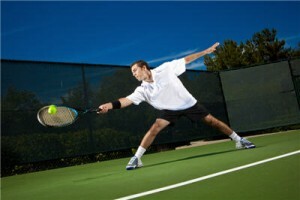 The arm, shoulder, lower back, hip, and calf muscles are all very active while playing tennis and commonly tighten up. Gently stretch these muscle groups to improve circulation, flexibility, and recovery. Work on your breathing and relaxation while you lengthen these tight areas. Hold stretches for 20 seconds on each side. Watch the video below to see a few of my favorite post-match stretches. These stretches are easy to do at home, at the gym, or at the courts. Try incorporating these stretches into your weekly tennis routine. These stretches not only minimize the risk of injury, but can improve mechanics and performance so you can play better, healthier tennis in in 2015. Stay tuned for next week’s blog on lateral movement, which will include some of my favorite footwork drills!